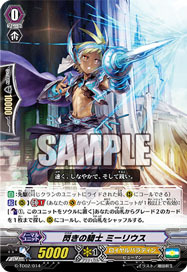 [A] [(R)]: [Counterblast: (1), Retire 1 of your other ::Gold Paladin:: Rearguards] When this Boosts a ::Gold Paladin:: and the attack hits a Vanguard, you may pay cost. If so, look at the top card of your Library and choose up to 1 ::Gold Paladin:: and Call it to a vacant (R). Put the rest on bottom of the Library. The black chain pierces the enemy and opens the path for allies.